Gecko at Akashavana Retreat Center in the Tarragon mountains in Spain. No phones. No computers. No internet connection. No newspapers. No contact with the outside world for 3 months. "But you can keep your phone right?" "But you can check email, right?" "But you can post on social media, right?" Nope. Just life on a mountain for 3 months, meditating and studying. Living in community. Chopping wood and hauling water. And hauling more water. In the Buddhist tradition we take time away from our day-to-day life, to simplify. We cook meals and eat mindfully, we reflect, we are together in silence. We spend time in nature. We practice gratitude. It's rich and it's nourishing. On the mountain in Spain I slept in a tent in a pine grove at the edge of a cliff. I was awoken at dawn by birds. I watched the flowers grow. I baked the bread. I made the peanut butter. I meditated. I hiked up the mountain. I built my own little shrines under trees. I watched vultures on the peak. I cleaned the composting toilets. I heard lambs being born. I watched ibex sparring. I wrote poems. I wandered through the woods with new friends. I watched the sun set. It's not easy to take a 3-month break from the routines of life, and a lot of people supported my unplugging. I am very grateful for that love and support. It's getting harder and harder for me to unplug. These days I carry my office in my pocket, using my phone to plan lessons, text friends, send photos, take classes, and attend international meetings. I love the connection and the ease. But it also keeps me distracted. These days I do shorter repeats. Unplugging for a month. A week. A weekend. An evening. Whatever I can get. And I carry that mountain, those meadows, that panorama, those friendships, and that stillness, in my pocket too. 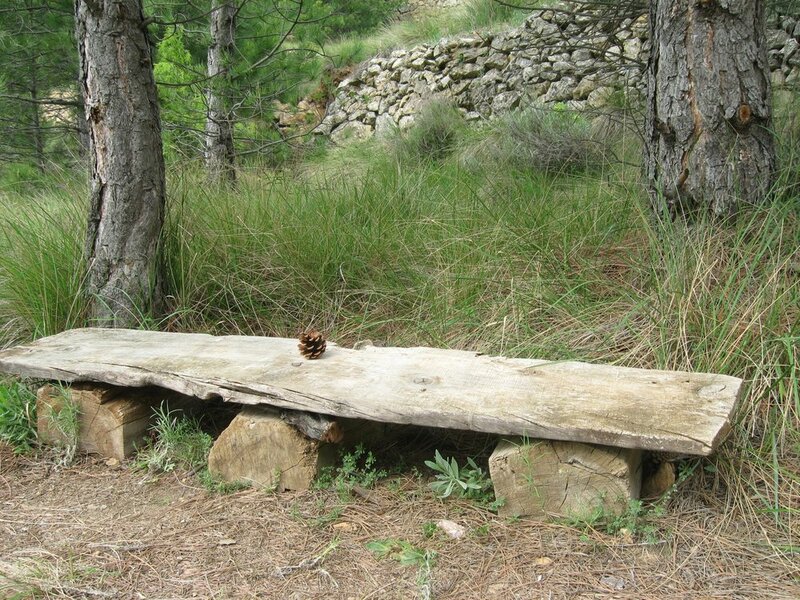 A hand-made bench outside the shrine room at Akashavana.